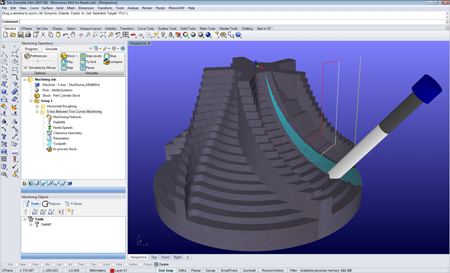 MecSoft Corporation, the developer of computer aided manufacturing (CAM) software solutions, has announced a new version of RhinoCAM 2012 that runs completely inside Rhino 5. "RhinoCAM 2012 for Rhino 5 leverages the numerous enhancements in Rhino 5 which makes the product combination an even more powerful design and manufacturing software suite for our customers," stated Anita Anand, VP of Sales and Operations at MecSoft. "This is the reason we are committed to supporting the latest versions of Rhino, as well as releasing yearly upgrades to RhinoCAM." RhinoCAM 2012 for Rhino 5 is a free download for current RhinoCAM 2012 customers and can be downloaded immediately from the RhinoCAM web site. Both 64-bit and 32-bit versions of RhinoCAM 2012 for Rhino 5 are available.